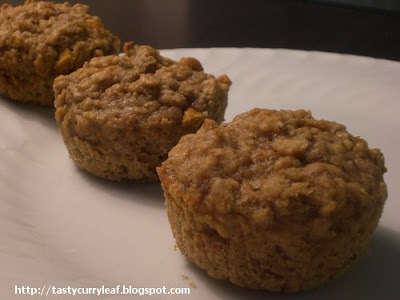 These are very simple muffins.I was planning to make butterscotch and oats cookies,then I saw the recipe for muffins here.It invovled soaking oats in buttermilk,which made me curious as it was the first time I saw/heard such thing.I tried it out with little adjustments and they were delicious and moist. In a big bowl,soak oats and brownsugar in buttermilk for around 1 hour..As far as I know,this is to soften the oats and make the muffin moist and soft.Grind flaxseed with water and keep aside.In a small bowl mix together,flour,baking soda,salt,baking powder.Melt butter and let it cool. Combine melted and cooled butter and flaxseed paste.Add it to the oats mix and combine.Add in the flour mix to the oats-butter mix in batches and stir to combine.Fold in butterscotch chips. Layer muffin tins with paper cups or grease with a cooking spray.Divide the batter in prepared tins .Bake in a preheated oven at 400F for 15-18 minutes or until top springs back when lightly touched. Cool for a few minutes and serve as desserts or snacks or part of breakfast.The recipe yields about 1 dozen medium size muffins. The muffins were moist and soft,maybe the soaking did the trick.Though the recipe specified soaking time of 1 hour,I soaked only for 30-40 minutes.I loved these as I like butterscotch desserts.You can also use choco chip or any other dryfruit if you do not like butterscotch chips. wow a new recipe and I was also curious to know your verdict. this looks delicious, will try this soon. Yummy and healthy muffins..they look so pretty too!! 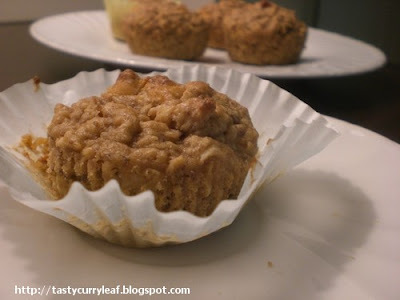 Healthy n delicious Muffins..looks amazing..cute they r..
wow.. thxs for sharing.. this is totally new to me.. looks really yummy dear.. This will make such a neat snack. My oh my! I love butterscotch chips! Bet this would have tasted just right. A different eggless muffin. I have not used butterscotch chips so far.